An amazing sight awaited down a long corridor on the second floor of the Waldorf Astoria Hotel in New York, past a dark screen and several alert secret service agents and then into a large meeting room. There, standing less than five feet apart, separated by Cardinal Timothy Dolan, were the two men fighting tooth and nail for the most important job in the world, the President of the United States. As I approached I could not but feel an extraordinary sense of pride. What an amazing statement about this country, that the two men in the midst of a titanic battle could set the battle aside and come together in the cause of raising $5 million for New York’s neediest. President ObamaandMitt Romneyseemed utterly at ease. I complimented Obamaon his Irish trip and he reminisced for a moment about it. “I need that Irish Moneygall vote,” he joked, referencing the village in Offaly where his ancestors hailed from. Mitt Romneyis ramrod straight, far younger looking than his 65 years, and his wife Ann is even prettier than she appears on TV. They are a striking couple, side by side. I asked Romney would he visit Ireland if elected. “Of course,” he said, “I’m a Massachusettspolitician, what would you expect,” he joked. Later, on stage, the two men gave command performances, firing punch lines not punches back and forth so rapidly that sometimes it was hard to catch them. They were in New York for the annual Al Smith dinner, the great lollapalooza of New Yorkpolitics, where everyone gathers for the annual rite of reminiscence to the firstIrish Catholic to run seriously for president. Henry Kissinger (he’s still alive!) was there, so was Ed Koch, Katie Couric, Chris Matthews, Governor Andrew Cuomo, Senator Chuck Schumer to name a few, and every bishop and major businessman and woman in the five boroughs and Long Island. MC was Al Smith IV, great grandson of the late and great Al and a born comedian with a wonderful sense of timing as he made the introductions. His best line was that Mitt Romney created more sons (five) than Obama did jobs. Romney has a sense of comic timing that was unexpected to me. He seems ill at ease often in such settings but not last night, where his zingers found their target and the crowd guffawed and laughed along. Obama proved equal to the task, if not quite as funny. His best line was how Mitt was Romney’ssecond name and he was lucky to have it as he couldn’t use his own much (it’s Hussein). He also gave a spoiler alert for Monday night’s debate on foreign policy (look away -- we killed Bin Laden if you hadn’t heard). The real surprise for me was Cardinal Dolan who made an impassioned speech about what he called the “un’s” in America, the unemployed, the undocumented, the unborn, the unmarried mothers, the unfit and forlorn. It was a passionate plea for both candidates to note that the government’s major role was to help those who could not help themselves. 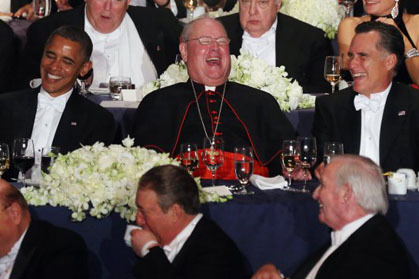 Dolan had come under pressure not to invite Obama because of the abortion issue. He proved last night he had done exactly the right thing and showed the power of the Catholic Churchin so doing. The 1,500 or so of those who attended went home happy and sated. As an immigrant, it was one of those occasions I thanked my lucky stars I had come to America. With so much at stake the two men fighting it out for the White House found time to come together to help and raise money for those in need. It was an extraordinary moment in a campaign known for its nastiness but one also capable of being kinder, gentler. We need more of that to lift people up.